Okay, major bummer. I go back to work next week! Darcy will be almost five months old and I know it's time, but I can't believe it's finally here. I'll be working three days a week and will be home with my sweet baby the other two, so it could be worse. My plan is to cook dinner on the days I'm home and do easy meal prep meals on two nights, then takeout on Friday. Who doesn't love takeout on Friday? So, have no fear, those recipe reviews will keep coming from me! 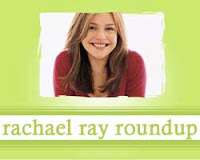 According to Broadcasting & Cable, Rachael Ray's talk show is a bright spot in an otherwise dreary ratings report. Given the ratings, it's no suprise that "[t]here are currently 180,000 people on the waiting list for tickets" to see Rachael Ray's talk show, according to the Starr Report. Otto at All Over Albany tested Rachael Ray's Booscotti. Kari Brunson of Anticiplate was inspired by Daisy Martinez's True Cod with Latin-Stewed Eggplant recipe from Every Day with Rachael Ray. Nicci at Kitchen Adventures tried an old favorite Rachael Ray recipe - Vodka Cream Sauce with Pasta. Cate at Sweetnicks gave Rachael's Two Sauce Weeknight Lasagna Bowls (or Deconstructed Lasagna) a try. Gail at Cooking at the Pacific Outpost made Cherry Whiskey Tofu after being inspired by Rachel Ray’s Pork Chops with Brandied Cherry Sauce. USA Today tells us about a parody of Rachael Ray's magazine. Grace, Grammar & Good Eats features a review of Rachael's Pizzagna. Kellie at Busy Mamas tested out Rachael's recipe for Spinach Artichoke Pasta.